How did the Giant Pandas get their black markings? Here is a story that tells you just how it happened. "Oh, it was a long and a dark day" when all the pandas, who were once completely white, fought a great fire dragon that tried to destroy their beloved bamboo forest. This is also the story of a wise old gatekeeper who loved and protected the wilderness for his good friends the pandas. 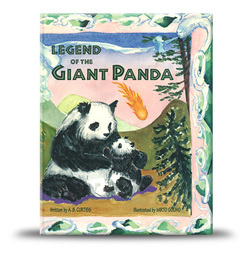 When the old wise man loses his life fighting the fire dragon, the pandas realize that there is no one left who will protect the forest for them. They learn at last who is the real keeper of their forest.